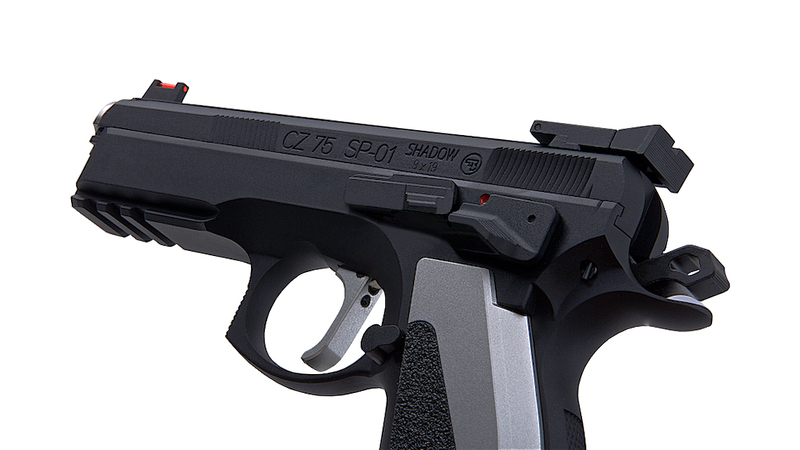 The new generation of CZ 75 SP-01 pistol especially adapted according to suggestions as proposed by users from Law Enforcement, Military and Police communities worldwide, with an additional input from the Team CZ world premier shooters Angus Hobdell and Adam Tyc. The original CZ-75 platform that the SP-01 Shadow based on was first introduced in 1975, it features a staggered-column magazine, all-steel construction, and a hammer forged barrel. It is well known for its quality and versatility and is widely used throughout the world and the SP-01 still share the same features from the well polished design from '75. While the KJ Works CZ SP-01 ACCU may look amazing, the feel of it with it comes to the materials and the way it shoots is just as brilliant. It features a full metal construction with a metal lower frame and a metal slide. 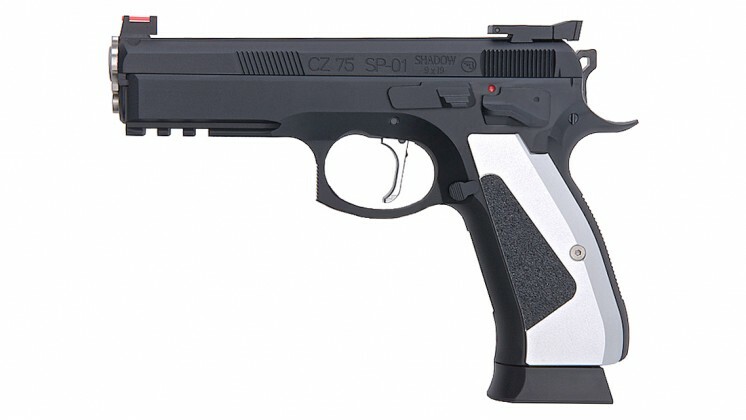 Basing on the CZ-75 design with slide rails inside the frame also means it has a lower bore access with a high grip angle that is favored by many. The lower frame despite based on the CZ-75 design, it was a complete new mould and features a few things that were not existing on the old CZ-75 design, such as a full length M1913 accessory rail for attaching various accessories and a beaver tail for a high grip angle. The slick metallic grip panels are textured with an extra later of sandpaper like texture and contoured silver. 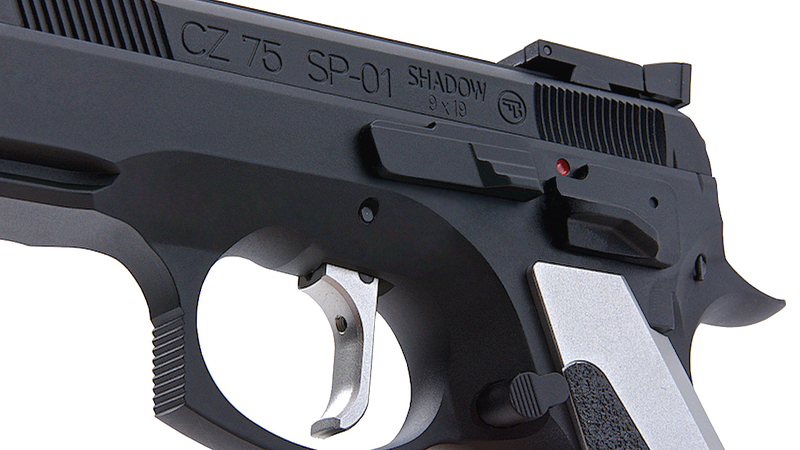 Operation wise, the slide on top should feel familiar to all the CZ-75 users, but it has also received a few updates to it, the serrations on the slide are located in both the front and the back for different racking style / chamber check styles; and the fibre optic front sight enables a quick target acquisition. The controls of the gun are also tailored to facilitate quicker operations with just bare movements of the thumb. The slide release and thumb safety are both contoured to double as a thumb rest for a firm even when shooting one handed. 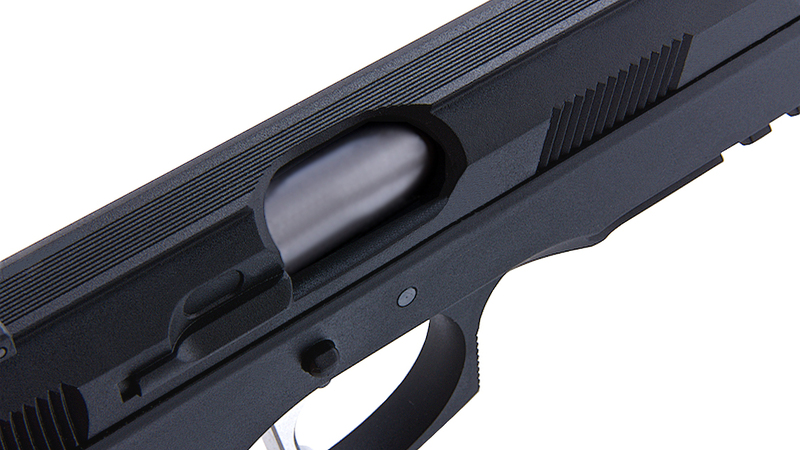 Trigger is a bit heavy when in the Double Action mode, but once the hammer is up, the Single Action pull is crisp and light, the trigger is also adjustable in pull and over travel. You can expect all the correct markings to be there as it is fully licensed by ASG, beautiful replica and realistic. 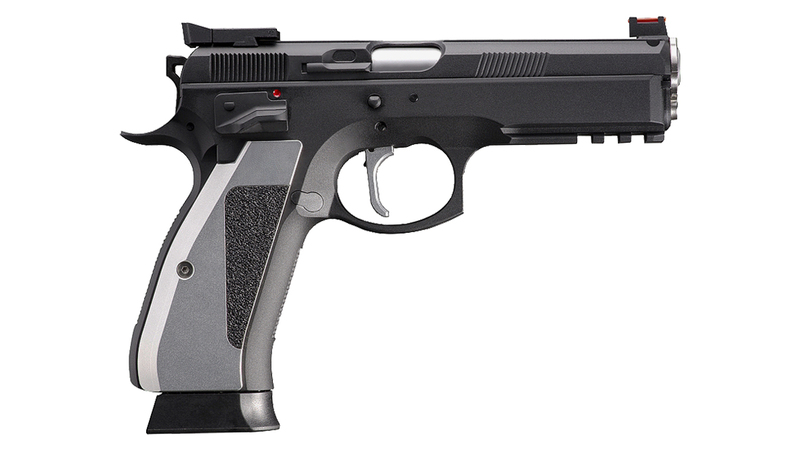 The CZ75 SP-01 ACCU cycles very smoothly as it clocks in at right below 370 fps, which is great for CQB. 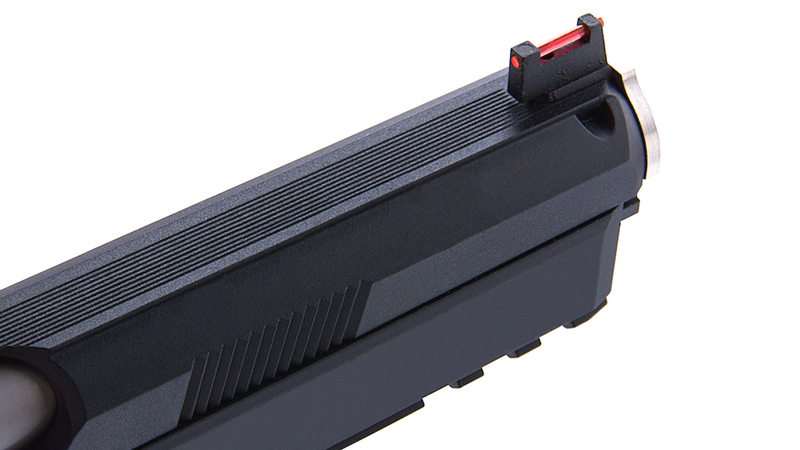 It comes with its own 25 Round magazine made specifically for the SP-01 ACCU. Both versions of the gun could use either co2 or gas magazines. 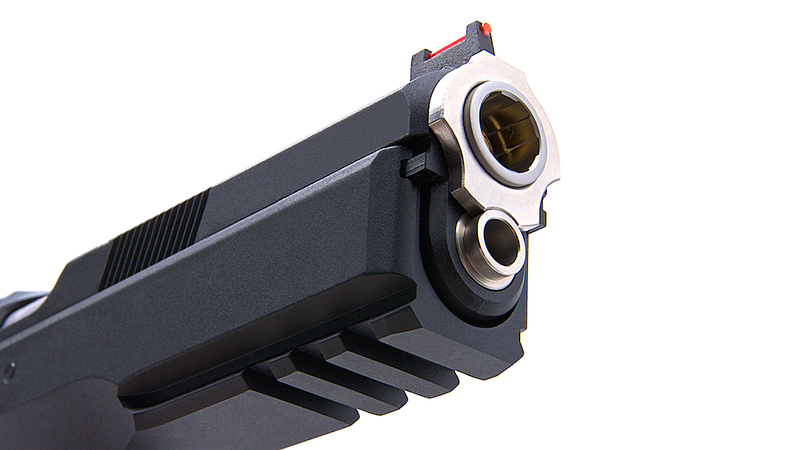 Seeing how popular the gun is, ASG/ KJ works have also introduced a line of accessories for the gun if one wants to push it further to a full competition pistol, scope mounts, slide racker / RMR mount, SAO hybrid trigger, Aluminum grip panels and magwell are also available for separate purchases, please check the related products section for your ultimate enhancements.